Sleight of Economics: Power Utilities Debt Changes Hands. A truant son has turned insolvent because of his profligate ways, and also indulgence and wayward interference of his father. Grand father orders the father, who too is near bankrupt, to assume half of the son’s debts and also orders those to whom other half of moneys are owed to wait 3 years for repayment. Grand Father is the local headman of the village and he is trusted simply because without him the village goes down like a house of cards. People whose moneys are stuck grumble but accept their fate while safekeeping their trust in God and their necks in the hands of the grand father. Would this make the son an attractive groom in the marriage market? Would he mend his ways? Would the father stop being indulgent and interfering? Or has anything changed in substance at all? Common sense would command a definitive *NO* as an answer to each of these questions. But common sense turns a scarce commodity when one comes to the wonderland of high finance and *Sovereign Governments* with ability to print practically limitless supply of *I Owe You -IOUs* or what is commonly known as money [Take a look at any currency and one would find a legend -I promise to pay the bearer the sum of….- or words to that effect solemnly affirmed by some important functionary of the state]. Source of 2nd Image: Affordable Housing Institute. A Little Difference in words, but the *promise* remains just that -a promise. 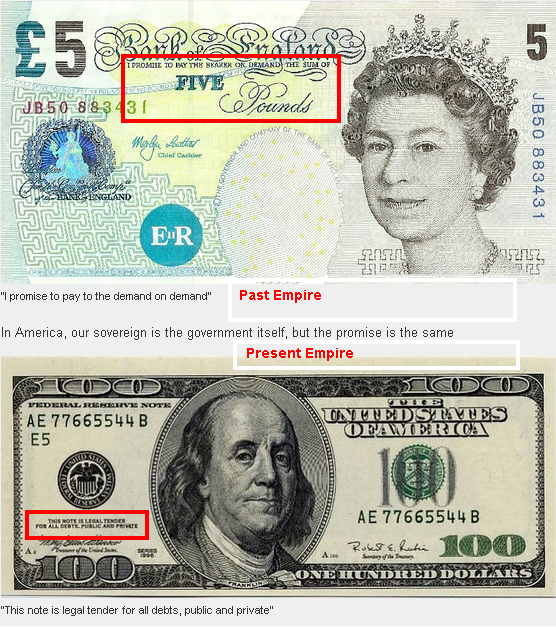 The 3 currencies in their order of appearance are printed on behalf of their sovereigns by Reserve Bank of India, Bank of England, and Federal Reserve. The first two institutes are publicly held by the respective States, but the last one surprisingly is held by private banks. USA is a highly indebted state and has gone on a big money printing binge called quantitative easing [QE-I, II, and III] to get over the hangover caused by the earlier wild party of runaway housing bubble. Such a profligacy from a lesser state like India would have rendered its government bankrupt long ago, but not USA. Everyone around the world still falls over each other to clutch US dollars as a legal tender, though common sense tells not to trust promises of someone who lives way beyond his means and has been doing so for long. Why then this *innocent* trust in dollar? Answer is simple. Money is a claim on labour or resource. And USA is the mightiest empire world has known. It can always take by force and violence as things have always been taken by empires through out history, what its money won’t buy, were dollar to be rendered worthless through over abundance. That not so unmasked threat is what makes dollar a *peaceful oasis* of world’s reserve currency – a position held until before the WW-II by the British Pound. In short, money is sanitised and attractively packaged violence [David Graeber’s masterly Debt: The First 5000 years is a must read to understand the history and politics of these ideas. ^^….arguments about debt and debt forgiveness have been at the center of political debates from Italy to China, as well as sparking innumerable insurrections. He also brilliantly demonstrates that the language of the ancient works of law and religion (words like “guilt,” “sin,” and “redemption”) derive in large part from ancient debates about debt, and shape even our most basic ideas of right and wrong. We are still fighting these battles today without knowing it^^]. Now that one has the necessary tools to see through artifice or deception, one can return to the story at the beginning. One makes following substitutions in the *fairytale* ahead. Son == State Power Distribution Utilities. Grand Father == Government of India. Debt == Bonds guaranteed by State Governments under the watchful eye of the Centre. India’s Union Cabinet cleared a Debt Restructuring package for power distribution utilities of INR 1,900,000,000,000 [1.9 lakh crores or 1.9 trillion rupees] on 24 September. The main elements of it were: ^^… about half of outstanding short term liabilities of distribution utilities (amounting to Rs 1.9 lakh crore up to March 31, 2012) would be taken over by state governments. These would be first converted into bonds, to be issued by the utilities to participating lenders, duly backed by state government guarantees. Also, lending institutions and banks have been asked to roll over the balance 50 per cent of the utilities’ debt, with a three-year moratorium on repayment…As an incentive, the Centre has offered to the states a grant amount equal to the value of the additional energy saved by way of accelerated technical and commercial loss reduction beyond the loss trajectory specified under the government’s flagship distribution loss reduction programme (Restructured Accelerated Power Development and Reforms Programme or RAPDRP), and capital reimbursement support of 25 per cent of principal repayment by state governments on the liability taken over by them under the scheme^^. What has changed? Nothing in substance, but in form it has taken off all the *Red Ink* dirtying the balance sheets of the state utilities and left them innocent of any short term debt. What was its effect on the economy? Zilch, as it is a zero sum game: ^^Taking over half the accumulated SEB losses under the bailout plan is likely to leave most states facing a sharply worsened overall debt situation^^. Naturally, the Red Ink has now splashed over states’ balance sheets. But on the Stock Markets, influence in plenty was reported. ^^Power stocks surged on Monday in anticipation of the government’s move, which was announced in the evening after markets closed. On a day the Sensex closed 79 points down, BHEL was up by over 6 per cent, lending firm PFC surged nearly 3 per cent, and power trader PTC India Ltd was up by over 2 per cent^^. So what did the government achieve by this? The three reasons that befuddle the power sector in the country are: Huge Transmission and Distribution [T and D] losses, Large scale theft of power, and Arrears in collection. In the last two, the pernicious and corrupting role played by politicians and utility officials is responsible. In the first, neglect and apathy of officials in taking corrective measures is to blame. State governments have allowed the Cost-Plus approach to run amok for long and would have liked to get away with recovering costs in full from hapless consumers but for the public uproar. No concrete and surgical plans are on the table to turn the tide, except one: ^^On their part, states must undertake milestone-linked reforms which include, besides yearly tariff revisions, changing managements of loss-making distribution companies, and moving towards a franchisee-based privatisation of select circles. ^^. Astute readers would have effortlessly substituted *Select Circles* by *Most Profitable Circles*. Privatisation is seen as the last and only solution in every sphere. And for that to become feasible it was mandatory to take the burden of the losses on people, that is socialising the costs, through the back door of state governments’ balance sheets; so that distribution companies become attractive consorts for the private capital. Had the proposal to increase tariffs, which may need to go up for fuel costs are rising, were accompanied with measures to reduce power consumption for which necessary technology is within reach; then power bills of the consumers, especially the poor, would not have become burdensome. Yet, governments have shown little appetite for simple but effective solutions. World Bank and IMF are agencies of the Rich that have specifically been mandated to gain complete PRIVATE control over rest of the World’s Resources as is already almost the case in USA. Chidambarams and Ahluwalias are its henchmen in India. On 28 September, Arup Roy Choudhury, the Chairman and Managing Director of NTPC Ltd. – country’s largest power generator, was interviewed by Financial Express, Coal Block cancellations will set us back by a Plan Period. Does this partially mitigate the mess in power sector? The problems in the power sector are two pronged — one being the distribution losses and the second on the coal supply side. So while the debt recast mitigates the distribution side problem, on the coal supply side though, the issues remain. There is absolutely no sign of anything drastic being done on the coal side. It’s true that new FSAs (fuel supply agreements) are being signed (by Coal India Ltd), which is a sign that they plan to increase (coal) production. But the problem is that the power sector is growing at a much faster pace than the rate at which coal production is being ramped up. Do you think the ongoing coal block deallocations would impact the power generation side? There are two points of significance here. As far as I know, no coal blocks allotted to public sector NTPC have been cancelled. Secondly, the committee of the secretaries which has been tasked with review of coal block allocations has been cancelling or en-cashing bank guarantees tendered by the allottees for not starting mining operations [in 56 blocks out of 57 examined by CAG] or for far from satisfactory progress. Are not private parties, who obtained the coal blocks by cozying up to politicians and then sat smugly on the natural resource so grabbed, criminally culpable for these delays? Roy Choudhry doesn’t even mention this fact significantly. P Chidambaram, Finance Minister, had the temerity to make virtue out of private sectors resource grab by suggesting, If coal is not mined, where is the loss? Another instance of how privatisation -a phoney solution- is passed on as a genuine one. It is crucial that each one of us learns to recognise and decode the sleight of economic policy that the masters of the universe want to serve us through their *obedient public servants*. That is who are on public salary to do private good.